Now that preliminary rosters for all competing teams in the 2013 World Junior Championship have been announced, expect plenty of healthy debate over which players should represent their countries when the two-week tournament commences in Ufa, Russia, on Dec. 26. Though all countries are required to submit their WJC rosters to the International Ice Hockey Federation on Dec. 25, most will have already announced their 23-player lineup two days earlier. Preliminary-round games in Group A will be held at the Sports Palace and those in Group B will be staged at Ufa Arena. The Group A field consists of defending gold medalist Sweden, Finland, the Czech Republic, Switzerland and Latvia. In Group B, Canada, Russia, the United States, Slovakia and Germany will battle in preliminary-round action. In addition to several top returnees and NHL-drafted players being named to selection camp rosters, there are many 2013 draft-eligible prospects in the mix. Here are 13 players who not only have a chance to survive the final cuts, but to hear their name announced in the early rounds of the NHL Draft next June in Newark, N.J.
1. 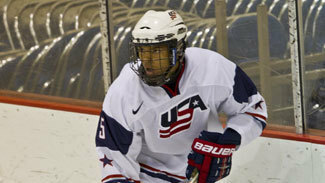 Seth Jones, D, United States: Rated No. 1 among skaters in the Western Hockey League on NHL Central Scouting's preliminary league rankings, the 6-foot-3.5, 208-pound defenseman will serve as captain for Team Orr at the Home Hardware CHL/NHL Top Prospects Game in Halifax, Nova Scotia, on Jan. 16. Jones has seven goals, 23 points and a plus-23 rating in 27 games as a rookie with the Portland Winterhawks this season. Barring injury, he is a lock to earn a spot among the top defensive pair for the United States. 2. Nathan MacKinnon, C, Canada: The 6-foot, 182-pound center from the Halifax Mooseheads is the top draft-eligible prospect on Canada's impressive selection camp roster. MacKinnon, the No. 1-rated skater on Central Scouting's preliminary rankings for players in the Quebec Major Junior Hockey League, is third in the league with 48 points (22 goals, 26 assists) and sports a plus-27 rating. He's piled up 53 goals and 126 points in 86 career QMJHL contests and was named captain for Team Cherry at the CHL/NHL Top Prospects Game next month. Whether MacKinnon is penciled into the top six of this talent-laden roster in the end remains to be seen. 3. Aleksander Barkov, C, Finland: The incredibly skilled forward from Tappara is actually a returnee for the Finnish National Junior Team. Barkov, Central Scouting's No. 1-rated skater in Finland, became the youngest Finnish player -- at 16 years and four months -- to score a goal at the WJC on Jan. 2, 2012, in a quarterfinal victory over Slovakia. The 6-foot-2, 209-pound player has 14 goals and 28 points in 28 games with Tappara in 2012-13. 4. Sean Monahan, C, Canada: The No. 1-rated skater on Central Scouting's list of players from the Ontario Hockey League has 12 goals and 36 points in 24 games for the Ottawa 67's. Monahan will serve as an alternate captain for Team Orr at the Top Prospects Game. The interesting thing with Monahan is his ability to play any position on the ice and his feistiness in the corners. 5. Elias Lindholm, C, Sweden: While the defending gold medalists will not have 2012 WJC hero Mika Zibanejad this year -- he'll remain in North America -- they will have 6-foot, 191-pound Lindholm, who possesses incredible skill and grace with the puck. Lindholm, ranked No. 1 among skaters from Sweden, is one of nine top prospects invited to Sweden's selection camp in Norrtalje, Sweden. He has five goals and 17 points in 29 games for Brynas in the Swedish Elite League. 6. Hunter Shinkaruk, C, Canada: The skillful center from the Medicine Hat Tigers is No. 2 behind Jones on Central Scouting's WHL list. Shinkaruk, an alternate captain for Team Orr at the Top Prospects Game, is ninth in the league with 39 points, including 17 goals, in 27 contests. 7. Jonathan Drouin, LW, Canada: The 5-foot-10.75, 185-pound forward, who flanks MacKinnon on the top line for the Halifax Mooseheads, is rated No. 2 among skaters in the QMJHL. Drouin, who has 15 goals and 43 points in 22 games, will serve as an alternate captain for Team Cherry at the Top Prospects Game. While the odds of him earning a roster spot for Canada might be slim, he did receive high praise from Hockey Canada chief scout Kevin Prendergast. "He's probably playing in the best [junior] team in the country right now in Halifax and he and Nathan are partly responsible for that, so he warranted the opportunity to come in here and show if he can continue that," Prendergast said. 8. Rasmus Ristolainen, D, Finland: A returnee for the Finnish National Junior Team, the 6-3, 203-pound defenseman of TPS is rated second among draft-eligible skaters starring in his country. Ristolainen had three assists and a plus-1 rating in seven games for Finland at the 2012 WJC. He'll be a key contributor along the blue line for Finland, as he can play a smart and physical game. He has two goals and 18 points in 25 games in Finland's elite league, SM-liiga. 9. Valeri Nichushkin, RW, Russia: The top Russian on Central Scouting's board has two points in six games with Chelyabinsk in the KHL after beginning the season in the minor leagues. Director of European Scouting Goran Stubb told NHL.com that Nichushkin is "a defenseman's nightmare in one-on-one situations when at top speed." While that analysis is reminiscent of the top Russian prospect last year, Nail Yakupov, Nichushkin isn't in that class at this stage. 10. Jacob de la Rose, LW, Sweden: The 6-foot-2.25, 189-pound left wing was a regular with Leksand in Sweden's second tier division last season and captained his country in the Under-18 Ivan Hlinka Memorial Tournament in August, notching one goal and three points in six games. His strong, finesse-type style and vision would certainly benefit fellow Swede Lindholm. 11. Bogdan Yakimov, C, Russia: Yakimov, No. 2 on Central Scouting's preliminary rankings for Russian skaters, spent the fall with Penza (three goals, nine points in 19 games) in the minors, but is now with Reaktor Nizhnekamsk in the MHL. In two games, he's scored one goal. The center takes advantage of his tremendous size (6-5, 202) and is mobile, in addition to possessing a good shot. 12. Ryan Hartman, RW, United States: U.S. coach Phil Housley likes what he sees in Hartman, a solid two-way player who "can change the momentum of a game with a big hit while providing offense." The 5-11, 187-pound forward, who can play both center and wing, has 11 goals and 27 points in 26 games for the Plymouth Whalers in the OHL. Hartman is No. 11 on Central Scouting's list of draft-eligible players in the OHL. Central Scouting's Chris Edwards is a staunch advocate of Hartman's ability. "He's not the biggest guy, but he shows no fear of getting involved and battles for the puck," Edwards told NHL.com. "He can hit hard and is aggressive on the forecheck. He sees the ice well, gets the puck through traffic with creative passes and offers a very good shot that he gets off quickly." 13. Marko Dano, C, Slovakia: Dano has certainly captured the eye of Central Scouting's Goran Stubb in Europe with his impressive combination of speed, stick work and smarts. The 5-11, 183-pound forward, according to Stubb, is presently the best pro prospect among the Slovaks and Czech Republic. In 23 games for HC Slovan Bratislava in the KHL, Dano has three goals, five points and a plus-3 rating. Central Scouting's seventh-ranked skater in Russia, Dano plays a steady two-way game. He could prove to be a valuable offensive threat for the Slovaks, who placed sixth last year.